An unknown type fire behind the Town Center at Split Rock Resort was reported to Carbon County Communications. As Ladder 17 was going in service, the county stated that the fire is being reported under the large 30,000 gallon propane tank that sits on the hill behind the hotel. A worker reported seeing flames shooting over 20 feet in the air and impinging on the tank. The fire quickly extinguished itself, as the built in safety system did its job and closed all of the valves from the tank. 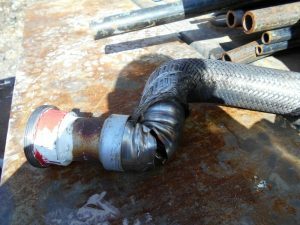 It was later determined that a hose line ruptured and sent liquid propane into an area of the system where excess propane fumes are burnt off, which caught the leaking propane on fire. Ladder and Tanker 17 were on scene for around an hour.The excess propane from the tank was subsequently destroyed several days later by burning it off using two large “Bunsen burner” type units. This was done to safely make the repairs on the system.